If a pattern makes you smile, you know it's a good one. Now more than ever, floral prints are all the rage! I think the best part about it is there's so many different floral prints out there so there's something for everyone to appreciate and love to pull out of their closets this season. '70s style is back and so is polka dots!! It brings back so many memories of when I was little because I remember loving polka dots when I was younger and Limited Too was where it was AT! It's back and classier than ever! Something about a white eyelet top with flutter sleeves just screams spring! There's no shortage of this pretty, almost lace-like detailing for spring 2018! There's been no shortage of straw circle bags this season, but this one is only $29! It's the cheapest I've found and still super cute. 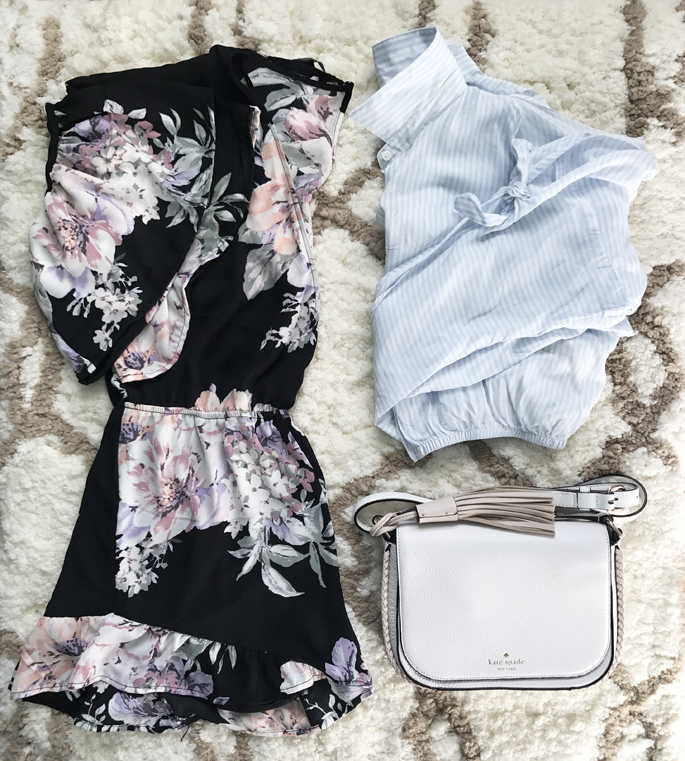 This cute floral romper (#3) is the one featured above, and it's so super cute - the ruffles make it so fun and it's great to have as the weather begins to warm up! So nice outfits! :) I am waiting for cleaning my closet, so I can recycle some clothes and get some new for spring or summer. 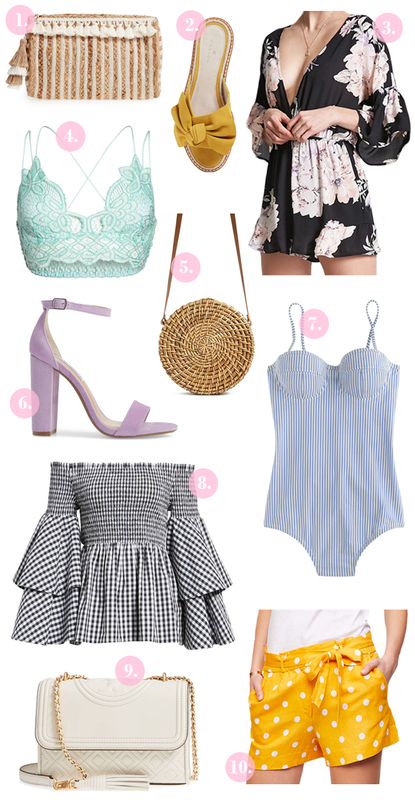 Gimme all the spring trends! Loving your picks so much. I've been loving any and all statement earrings and I love that pom pom straw tote you included. LOVING all of these trends. I just picked up a pin stripe top that is darling and I can't wait to style it. Polka dots and pinstripe are so me! I remember getting a hand me down Limited Too polka dot skirt that I wore until I literally could not get it to zip at all anymore. It was a sad day when I passed it on to a friend. I love the vintage-y modern looks. I'm suchhh a fan of straw hats and accessories!! also LOVE those fun bright sneakers you picked out with the florals! how fun!! I'm so glad to see polka-dots making a trendy comeback! I use yellow as an accent color more often than the main color. I definitely need to get some more straw accessories in my wardrobe - so cute for spring! I'm obsessed with all of these trends! I definitely need a circle bag though! OMG I'm really feeling the straw bag trend. I'm yet to get onee! I'm loving straw! I need to pickup a cute bag for vaca! I recently just bought the ciao bella soludos and love them! I've really been loving the straw accessories and circle bag trend. I want all of the straw, gingham, and circle bags haha. I need all of these!!!! I almost can’t stand that I’m such a trend lover but I can’t help it!! We are going on vacation in a few weeks and I absolutely need them all!! I want my own sweet little circle bag for summer and I adore gingham. Spring trends are often my favorite because they are so happy and bright! I'm obsessed with literally everything here. Florals are my favorite for spring. I totally forgot about yellow too! Yay for Spring! Loving all your picks, especially the florals, which are on-trend every "season" where I live. Aloha! Loving the sheer gingham skirt. I like that it takes the bold print and tones it down in a way that would be more approachable for people who traditionally don't wear prints. Really cute. We're going on a big vacation this summer so I'm looking for a great straw hat! Now I'll look for one that'll transition from spring to summer with these. My favorite trend definitely has to be the yellow! I love how the color looks on me! And this is why Spring is my favorite! So many pretty patterns and colors! I love yellow for spring! It's such a happy color, especially right after all the cold, winter weather. I just can't wear it, so I'm living vicariously through everyone who CAN pull it off! Love the trend yellow.. i need all of these. we are going on vacation. Great collections! I love the refreshing patterns, colors and designs! OH I want everything, can we do that?! I love that floral romper, and those lilac shoes! The off the shoulder gingham top is also pretty! I LOVE those straw bags!! Amazing post! Everyone wants to look trendy and glamorous. It's just that you need to understand what will look cool on you. Once you got to know your style, you will automatically pick the accurate style for you.